A Satan’s Statue Was Being Displayed In Lahore Museum And People Think It’s A ‘Yahoodi Saazish’ By Illuminati! 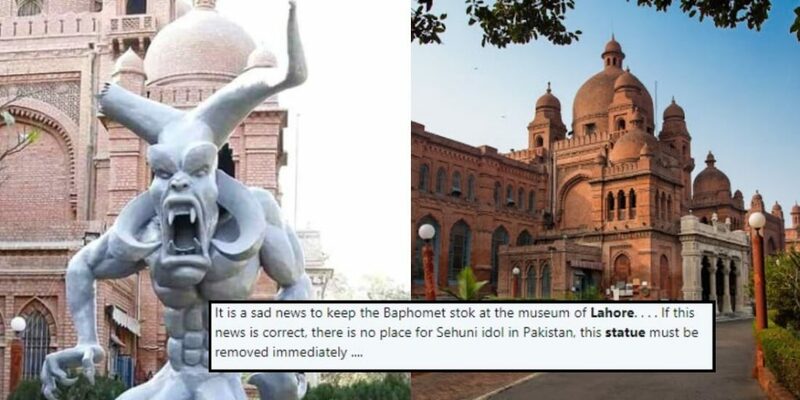 Lahore High Court (LHC) has issued a notice to Chief Secretary Punjab and Director of Lahore Museum on Thursday to submit a reply on pertaining to a petition seeking the removal of ‘Satan’s Sculpture’ from outside the Lahore Museum. The petitioner Barrister Ambreen Qureshi contended in the petition that the statue is horrifying the children. It has no link to the art, science, culture, and education. “This sculpture has nothing to do with our culture whereas the purpose of a museum is to preserve our history and culture,” Qureshi stated and requested the court to order its removal. Justice Muhammad Farrukh Irfan was hearing the petition and asked the directives for its removal. “To control Satan is the responsibility of us all,” observed the judge who was thankful that at least someone came out against the devil. A student of Punjab University College of Arts and Design (PUCAD)- Ibraat Ul Hasan had made the 20-feet high sculpture which was placed in the front yard of the museum. The News Of ‘Satan Sculpture’ Spread Like Wildfire And Here Is How Twitteratis Reacted To It! A Leaked Video Is Telling Another Story! According to People, The Sculpture Is Similar To The Satan’s Picture In Historical Books! A Few Social Media Users Appreciated The Art piece! But what of those who do Satan’s bidding? Even People Are Calling Lahore Museum The Head Office Of Illuminati!!! Is Lahore museum head office of Pakistani Illuminati? According to media reports, the museum has hidden the 20-feet sculpture with cloth now. The administration has told the local media news channel that the statue is not a part of the museum, but a part of an exhibition being held there.